I made seven bags of miscellaneous small items as well: animal figurines, action figures, super bouncy balls, spinning tops, wind-up robots, and the like. I also gathered activity bags, magazines, activity books, medium-size balls, and other solo- and group-play supplies. Bigger items that would still fit in the bins were set aside to be parceled out: his larger fire trucks, for instance. Things that belonged in a logical grouping were arranged in a single bin together: a cash register with a wallet, play money, a shopping bag, and items to buy. For items too large for a baggy but that needed to stay together, I used larger bags (whatever I had on hand). The downside is they're not see-through, but needs must. Toy food is an example of a logical grouping; you wouldn't want to play with just one carrot — you want several themed pieces plus utensils. But if you have a lot of toy food, for example, you could include several pieces in a couple bins. Sensory play: dried colorful lentils and scoops in a mesh produce bag . Just add pans. You know, I think I answered my question from earlier about better bags to use, because these produce bags are see-through and reusable, and have an easy drawstring opening. Babies like emptying bins the best. 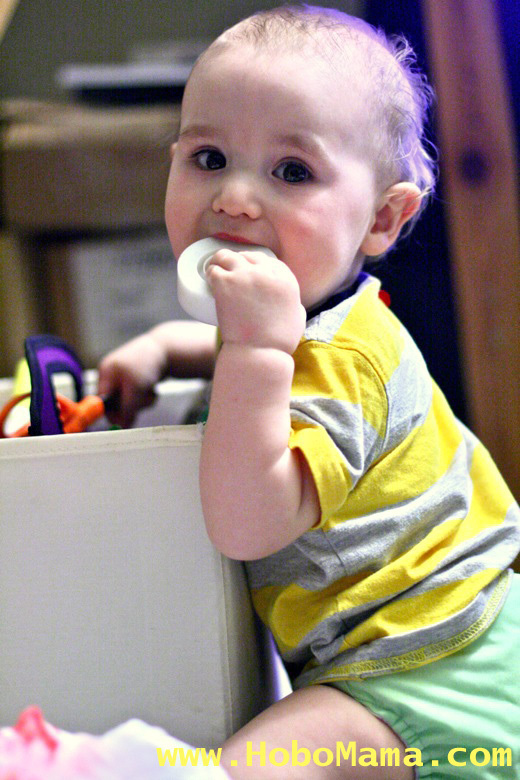 Here Alrik chews on a find from the craft bin. 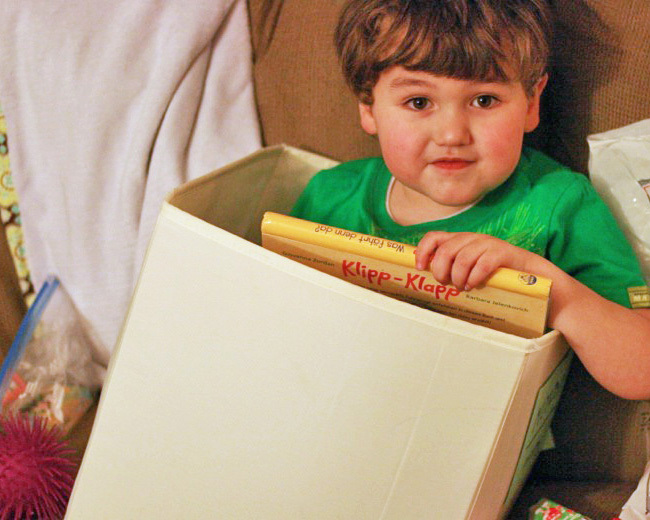 Dolls and dollhouse — I could see dolls and assorted clothing being split up into multiple bins and considered it, but Mikko likes to play with all his dolls at once and, if in a doll-playing phase, will make us find any that are missing. He has three favorite dolls, you see, and one is the father, one the mother, and one the baby, even though they all look almost entirely alike. He doesn't play with them the way I did as a girl (as imitation babies or clothes models), but it's fun to see what he does find for them to do. On any given day, we can pull out that day's bin and set it next to Mikko. Does the whole thing get dumped? Oh, yes. That's a disadvantage of any opaque storage system. But fortunately, it's just one bin, so we can (theoretically) clean it back up before bedtime. We are not perfect about this by any means and could all use more lessons in picking up after ourselves. But it's a more manageable start. I think to make things even easier on us, we should label each baggy with a permanent marker, with the contents and the day ("Monday: Vehicles"). Mikko has a range of toys to choose from for the day, and he sees each selection only once every seven days, so there's less chance of boredom. 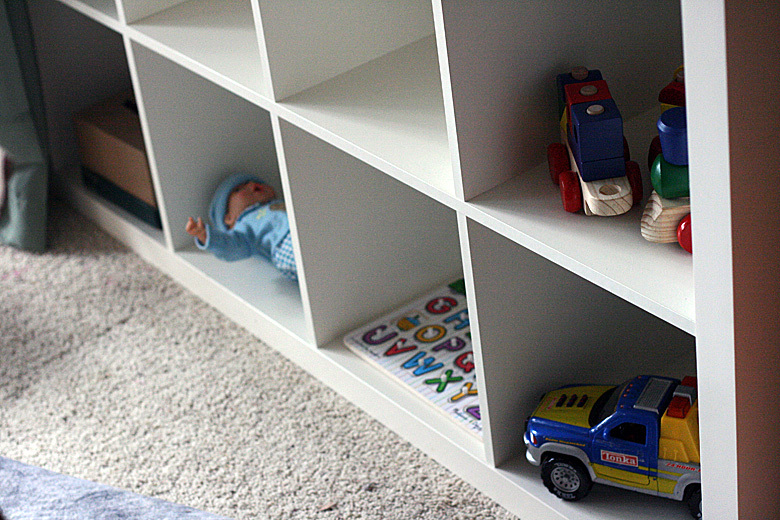 I've long loved the idea of toy rotation but found it hard to implement in a small space with limited storage. We don't have a garage or basement or even extra closet space to keep toys out of sight. This isn't quite as long-term a rotation as I'd choose in an ideal world, but we live in an actual one, and it's working well for now. Mikko's taken to the system with relatively little fuss. We set up a rule of one bin at a time, and he's content to stick with it. If he wants a new bin, we have to clean up the one that's out first. We're not draconian when it comes to enforcing which bin he plays with each day, either. If he really wants to play with the big police car that's in Wednesday's bin but it's Monday, we put Monday's bin away and pull out Wednesday instead. The day system is more of a gentle guidance, to ensure a variety of toys and a helpful routine. Usually he's plenty interested in what bin is today's. Independence-wise, we do have to lift the bins up and down for him, both because they're heavy and because the bookshelf is rather tall for him. In a small space, we have to use vertical storage rather than spread out. However, once the bin's out for the day, he can operate it himself and choose what he wants to play with from the options inside. Sam labeled the bins in English and German (I wrote out the days of the week for him for the German), which means that Mikko's getting a dose of education with each toy retrieval: time, reading, and language. For Alrik for now, we have a single bin: Baby Toys. Of course, he doesn't stick with just his own kind, and frequently and gleefully latches on to Big Brother's exciting selections. We might have to reconfigure the system as the kids grow, depending on how well their play needs mesh with each other, considering they're four years apart in age. Another potential downside is that Mikko loves to take his toys along for the ride: on walks, in the car, upstairs to bed. So finding them and returning them to their appropriate bins can be a challenge. I won't pretend that the bins haven't gotten more mixed up over time, but since they were mixed up to begin with, it's not much of a problem. So far, we really are digging our bins. I like being able to find all pieces to a particular activity. I like that Mikko will play independently for longer when it's easy for him to find toys and make up his own scenarios. I like that he gets excited about the group-play options within the bins, such as a puzzle or project we could do together. I like that a plea to watch TV usually fades away once a bin is placed beside him. I like that putting toys away is more straightforward. I like that our play area is contained and neat. So that's how we've binned our toys. 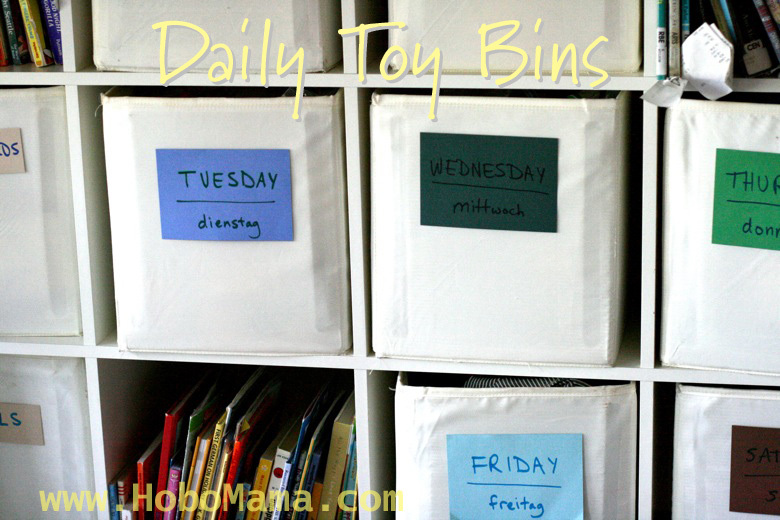 How do you organize toys and playtime? I absolutely love this idea. My two year old is now leaning towards "older kid" toys, and they are smaller and just a big mess. We are also in the process of moving his room because we are expecting another baby, so this is such a great idea for starting the "tiny toys" collection that will certainly come. Thanks for a great idea!! We have a playroom in the basement that hosts all the role playing and building toys... the goal is to have that room in tip-top shape before Liam turns 5 so I can have that as our school room. Upstairs, I do a toy rotation (which reminds me that we're due). Liam no longer naps (*tear*) so I made up rotating baskets of activities for him to play with during quiet time. The only time he gets those baskets are for an hour in the afternoons, so they stay special. Truthfully, though, I keep weeding toys little by little. I only want to have 1 box of toys in storage at a time (aside from the infant ones)... just because we have a "huge" amount of storage and living space in this house doesn't mean I want to have it crammed to the gills! Really interesting idea! I've never seen someone do this before, but it makes sense. 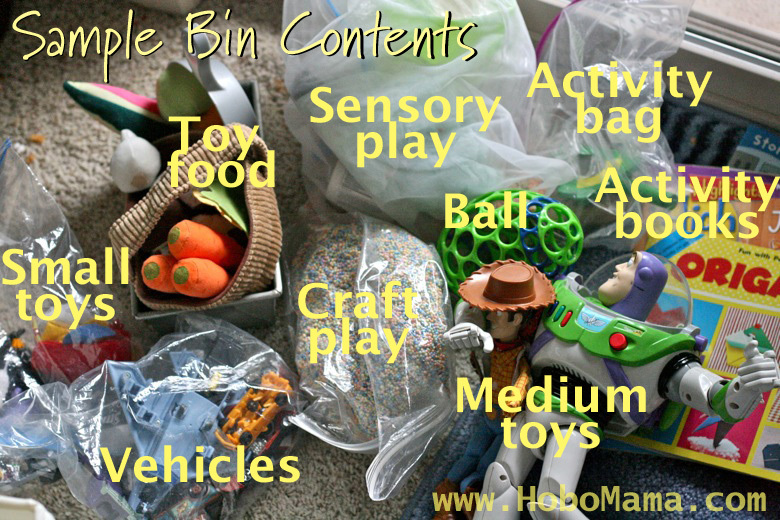 I have toys organized by what's in common in clear plastic bins, cars, potato head, etc. but the reality of how my kids play is more of a mish mash. 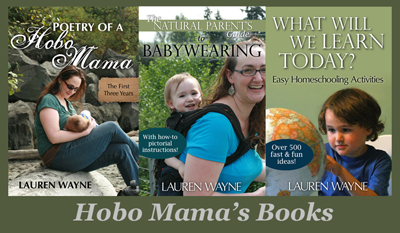 You are so creative-I never would've thought of organizing them that way! We just have them organized by type-action figures in one, dinosaurs in another, etc. But my son likes to play with one type of thing at a time, so that works well for him. See through, relatively durable, cheap. We don't have a lot of space either, but we recently started using one of those hanging mesh divided thingies. It holds trains in one area, cars in another, stuffed animals in yet another... it works relatively well. We also use a drawer under my son's bed to house larger toys that take up too much space around. We still have a mess and tons of missing pieces, though. It's hard getting the 3 year old and 20 month old to play together or put things away right now. They're convinced they need EVERYTHING at the same time. that looks like a fantastic solution to the ever-increasing toys crisis! It also ties in really well, if you ever explore it in the future, of the workbox system (I think that's the right name) which we used for homeschooling. Basically you put each piece of work into a separate box / folder and it really helped DD stay focused and avoid overwhelm; just like this is working for toys right now. Thanks for sharing your inspiration!